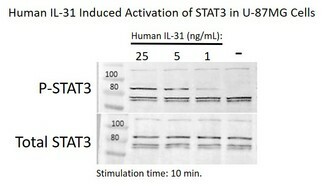 Interleukin 31 (IL-31) is an immunoregulatory cytokine that is expressed by activated type 2 T helper (Th2) cells. IL-31 signals through a heterodimer receptor consisting of the IL-31 Receptor A (IL-31RA) and the oncostatin M receptor (OSMR), which are expressed on monocytes, epithelial cells, and keratinocytes. 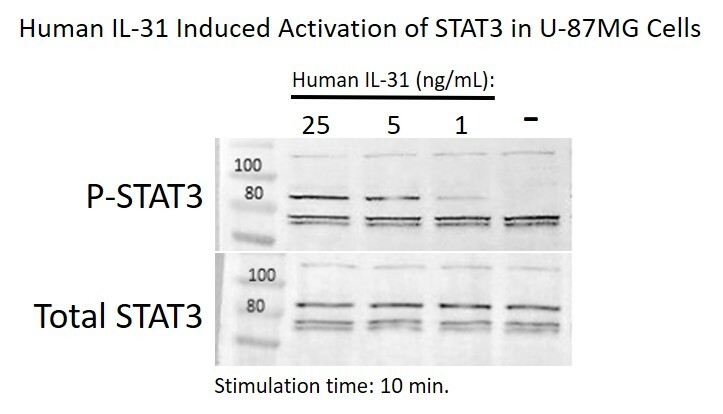 IL-31 promotes allergic reactions and inflammatory skin diseases. Less than 1.0 EU/µg protein (determined by LAL method). Centrifuge vial before opening. Reconstitute with sterile water at 0.1 mg/mL. Suspend the product by gently pipetting the recommended solution down the sides of the vial. Do not vortex. Allow several minutes for complete reconstitution. Shipped at room temperature. Prior to reconstitution, store at -20°C. For prolonged storage, dilute to working aliquots in a 0.1% BSA solution. Store at -80°C and avoid freeze-thaw cycles. Format: Purified / Lyophilized / Endotoxin Level: Less than 0.1 ng/µg of protein (less than 1EU/µg). Format: Purified / Lyophilized / Endotoxin Level: Less than 0.01 ng/µg of protein.